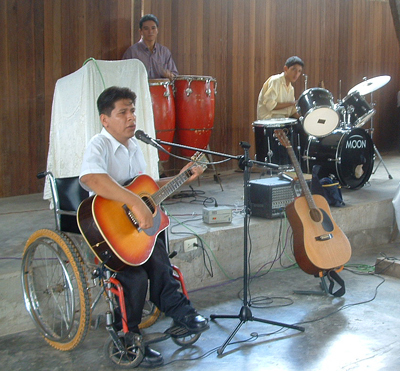 Today, the association “Refugio de Esperanza” in Pucallpa, Peru, comprises five sections. 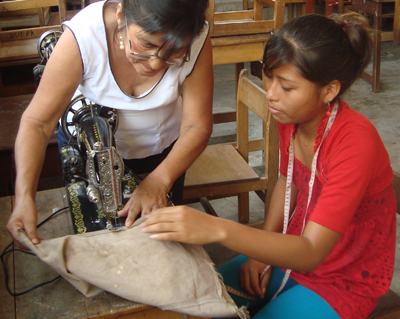 All these programs are run by approximately 100 Peruvian teachers, therapists, counsellors, pastors and staff, half of whom work as volunteers. The elementary school is the heart of the Refugio and serves about 500 children, pre-school through 6th grade (~ 60% with physical disabilities or special needs). A vocation training program serves 40 young adults with physical disabilities who learn a specific trade, such as carpentry, sewing, hair design, or computer technology. Room and board is provided for 40 students who come from distant villages or have been orphaned. These students live on campus and attend elementary school or trade school depending on their age and level of education. The food, electricity and water for the boarding program is sponsored mainly by donations. Physical therapy, language therapy and classes in braille and sign language are offered for children at the school and in the community. Wheelchairs, prosthetics, orthotics, braillers and other assistive devices are provided and repaired for students. This program relies heavily on your donations, and there is currently a shortage in this area. We have a full time psychologist, social worker and counselor who provide assistance for students on campus with emotional and development needs. There is also a chapel on campus which provides Christian services and Sunday school for children and adults. The services are open to anyone in the community. In order to become more economically self-sustainable, goods are produced at the Quince Tree farm and sold on local markets. Hens: For 5 dollars, you can adopt an egg-laying hen. Surplus eggs will be sold in the market to provide income to support the educational programs for students with disabilities.